While interning at the Gregg Museum of Art and Design, I came across many photographs from the Caroline Vaughan collection. This was partly because Caroline Vaughan is one of the first donors to donate her entire life’s collection to the Gregg while still alive. Mentored and inspired by significant photographers such as Imogen Cunningham, John Menapace, Minor White, and Ansel Adams; Caroline Vaughan remains one of the most influential photographers from North Carolina. Born and raised in Durham, Vaughn attended Duke University for creative writing. In 1971 Vaughan went to graduate school at M.I.T for photography, studying under Minor White in his seven-person graduate seminar. The set of photographs by Caroline Vaughan that stood out to me the most were her portraits, in particular her portraits of her parents. 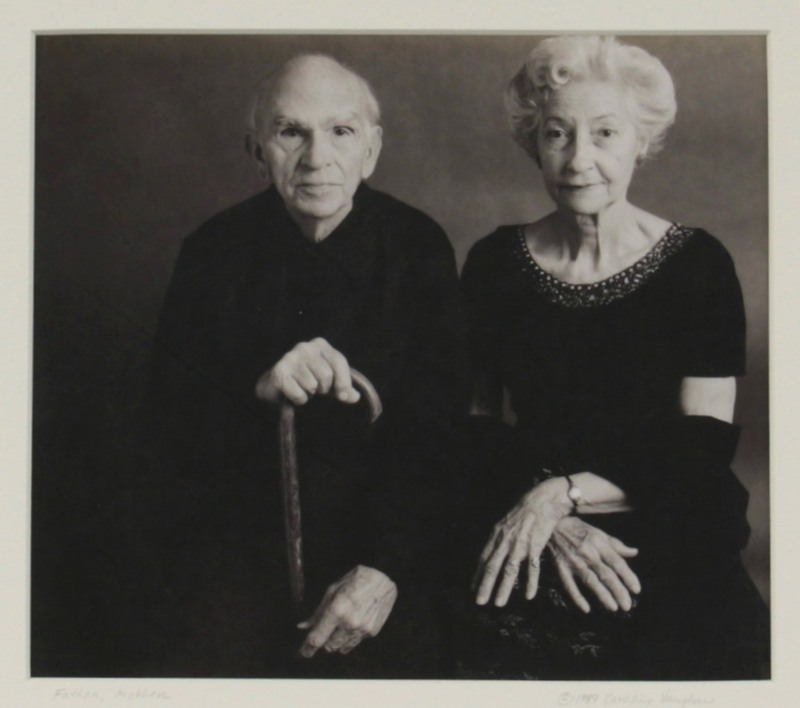 The portrait of Vaughan’s parents appealed to me the most because the black and white contrast gave the photograph a refined appearance, enhancing the individual features of the couple. The father stares directly into the camera, holding a cane in one of his hands. While he is a little hunched over with age he is rather dignified in pose. The mother has very good posture; she sits straight up with her hands folded delicately on top of her lap. Both the mother and father are wearing nice, clean clothing suggesting a wealthy middle class status. Lastly, the couple is positioned very close together as if the connection between them is still as healthy and strong as it was when they were younger. The elegance and sophistication of Vaughan’s portrait emanates and penetrates my eyes and mind. Vaughan has managed to capture them in a way that makes me envious, envious that I am not her mother in the photograph! I don’t think I have ever seen an older couple captured in such a beautiful and intriguing manner. I can only hope that one day I will have the elegance and sophistication that Vaughan successfully portrays in her portraits. ← Intern Meredith, “wears” a dress from the collection!